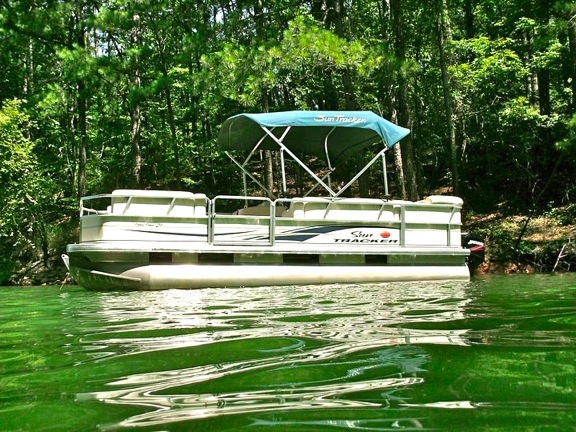 • Keep It Clean- Unless you keep your boat covered 24/7 (and what’s the fun in that? ), it’s gonna get dirty. Dust, pollen, food and beverage spills, dead bugs, etc. add up quickly. Cleaning your boat regularly with fresh water and a sturdy brush not only shows you take pride in your vessel, but it also reduces the need for heavy cleaners. Simple Green works wonders on carpets and upholstery, and make sure you use a hard, non-fouling paint if you plan in scrubbing the bottom of the boat while in the water. • Keep It In The Tank- As the BP spill last year showed, one of the biggest threats to marine life is hazardous chemicals entering our waters. When filling your boat’s gas and oil, resist the urge to top off the tank, and use oil absorbent pads to catch any drips from the fuel nozzle that occur between the dock and the boat. If you keep your boat on a trailer, consider fueling up before you put your craft in the water. • Keep It In The Tank, II- This time, we’re talking about poop. Peeing in the water may be a tradition as old as time itself, but untreated sewage is bad for coastal and inland waters alike. If you need to poop, do it in a restroom before leaving shore. If nature calls while you’re out on the water and your boat has a head, use a USCG-approved Marine Sanitation Device, preferably with enzyme deodorizers. • Keep Your Trash- Nothing spoils the beauty of nature more than piles of garbage (OK, and maybe the noise of jet skis, but that’s a different story). If you take a picnic out on the boat, make sure to bag all your trash carefully before you drive away, using an on-board trash can that can later be divided into recyclable and non-recyclable elements. Don’t throw ANYTHING overboard, not even cigarette butts, and consider spending a few minutes bagging up trash from your favorite cove or beach to leave the place a little bit better than it was when you arrived.